Single entries are $95 each. Campaigns are $175 each. Work done pro bono is free if accompanied by a paid entry. Choose the category that best fits what you want judged. You will be presented with two levels of categories. You choose a parent category such as Website and then a secondary category such as Business to Business. WHAT DO I INCLUDE WITH MY ENTRIES? dotCOMM lets the work speak for itself. For most entries, the final product is all you need. Explanations, although not encouraged, can be uploaded and will be read by judges. In the case of a campaign, enter work product and any explanation or recap provided to an internal or external client. If needed, a concise overview of objectives, challenges and solutions will suffice. WHEN DO I UPLOAD MY ENTRIES? During the entry process, you will be given the opportunity to include a URL if the entry is online. Otherwise, you will be prompted to upload or mail in your entry after check out. Most formats are accepted. In the rare event the file can’t be opened, you will be contacted. Receipts and Paperwork will be automatically emailed after checkout. HOW CAN I CHANGE MY INFORMATION OR ADD MORE ENTRIES? Through your My Account on our website, you can pay later, upload, add to or manage your account. WILL YOU DISPLAY OR SHARE MY WORK? We recognize the need for confidentiality, permission etc. and will not display or comment on any entries without prior permission from the entrant. However, unless otherwise requested in writing by entrant, client company will be included in winner’s list. WHEN DO WE GET RESULTS? All winners will be announced and results will be posted to your My Account by August 1. Since entries are judged against a standard of excellence and not each other, some results for early entrants will be posted prior to the final date. An email will automatically be sent when results are posted to your My Account. During the entry process, there will be a Chat option at the bottom of the page. There is also additional entry information on our website. You can email us at info@dotcommawards.com, or call 214-377- 3526.
dotCOMM Awards’ categories are the elements of the web’s evolving tools. Interactivity, content, design, social media, video, apps, blogs and influencers are all important components of digital communication, marketing and advertising campaigns. Together, they generate branding, customer engagement and ultimately sales. dotCOMM entries come from corporate communication departments, public relations firms, digital shops, advertising agencies and freelancers. Entrants include designers, developers, content producers, digital artists, video professionals, account supervisors, creative directors and corporate executives. The Association of Marketing and Communication Professionals (AMCP) administers the program. The international organization consists of several thousand marketing, communication, advertising, public relations, media production and free-lance professionals who have entered AMCP competitions. The Advisory Board oversees awards and recognition programs, provides judges and sets standards for excellence. AMCP also administers the MarCom Awards, Hermes Creative Awards and AVA Digital Awards, perhaps the largest and most prestigious international recognition programs in the world for marketing and communication professionals. WHAT IS THE MISSION OF dotCOMM? The mission of dotCOMM is to honor excellence and recognize the creativity, hard work and generosity of the creative professionals involved in web communication. Over the past several years, AMCP's Advisory Board has allocated over $250,000 to charitable causes. AMCP also supports the generosity of its entrants by not charging for entries that were produced pro bono for nonprofits. AMCP has overseen marketing and communication programs since 1994. The industry has changed drastically since then, and while other programs have incorporated web categories, AMCP entrants wanted a competition solely focused on their web creativity. Recognition for you, your clients and others in your organization. Winning an award from a noted, third-party evaluator of creative work is an important confirmation that the creative work you are producing is honored by your peers. Winners and information about the entry are listed on the dotCOMM winner site and map. In addition, most winners tout their achievement in their own marketing materials. Many winners commemorate their achievement by purchasing for themselves and their clients the attractive, high-quality doCOMM trophy. 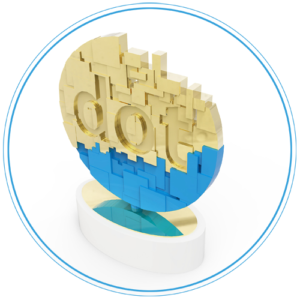 WHO MAKES THE dotCOMM AWARD? The dotCOMM trophy is designed to pay tribute to the evolution of web and digital technology. The award is a metal cast dot broken up into individual digital bits. The three-dimensional dot sits above an oblong marble base that has a plate inscribed with the winner’s information. The award and base total eight-inches tall. The award is platinum and blue for platinum level winners and gold and blue for gold winners. The casting is six and one-half inches tall, six-inches wide and three-quarters inch thick. The award is presented in an elegant, Tiffany-style, satin-lined, presentation box. To ensure fairness and consistency, most entries are evaluated by our judges in Washington and reviewed in Dallas. It takes two months of full-time work to judge all the entries. Each entry is judged against itself and not directly against other entries. There could be no winners in a category or multiple winners. There are no lengthy essays to persuade the judges; so all work will be evaluated solely on its own quality, creativity and resourcefulness. Judges base their decisions on learned perceptions of creative excellence rather than an entrant's imaginative explanation of an entry's value. Entries are judged at random. They are not grouped by categories. Each entry is viewed and discussed individually. The judges are experienced professionals who have had projects similar to anything that is submitted. The judges are cognizant of what an entrant has to work with and make their evaluations accordingly. Entries receiving scores between 90-100 points are Platinum winners. Entries with 80-89 points are Gold Winners. Entries scoring from 70-79 receive an Honorable Mention certificate. WHY DO WE HAVE TO PAY FOR TROPHIES? There is no obligation to purchase a trophy. Each winning entry is eligible for a free certificate. Unlike most competitions, dotCOMM entrants do not subsidize awards for the winners. Instead of charging up to several hundred dollars per entry, competition organizers decided to keep entry fees at a fraction of that cost and let the winners buy their own awards if they so choose. The result is more affordable entry fees and a higher quality award that is not a trinket, but a piece of art that anyone would be proud to display and give to a client. WHO SEES MY ENTRIES? DO I NEED TO ENCLOSE COPYRIGHTS, CREDITS ETC? Since many of the entries are internal or proprietary in nature, or are done for someone else, the entry file will not be displayed anywhere without permission. During the entry process, entrants will be asked to check a box granting permission to possibly display the entry on our blog, gallery and/or winner list. AMCP assumes that entrants have rights to materials and the authority to enter them, so there is no need to enclose that information with entries. A pro bono entry is a project that you did for free for a nonprofit that does not employ you. In other words, you did not get paid to do the work. An example of such work would be you personally or you in your role at whatever company you work for, designing a web site for the local homeless shelter. Only entrants who enter a regular piece in the competition are eligible to enter pro bono work at no cost. This is a perk for those who help defray costs of overhead, mailings, judging etc. You can only have one pro bono entry per client. You can have up to three pro bono clients. If you want to submit pro bono work only, you must pay the regular entry fee.